Tess Lindsay has spent most of her life on the remote Isle of May, uncertain of heridentity. Raised by the two sole inhabitants of the island, she is left to fendfor herself after their deaths, until a stranger washes ashore in a storm. Tess pulls him from the surf, not knowing that in saving the Highlander she is saving herself. If good looks and a taste for adventure are a curse, Colin Macpherson is destined for ruin. Until he ends up a castaway on Tess's windswept island, he's been roaming the seas, seeking fame, fortune... and a different girl in every port. But his fascination for this strong-willed lass goes beyond her wild beauty, intriguing him as no girl ever has. As Colin gains her trust, Tess reveals what little she knows about herself and her past. 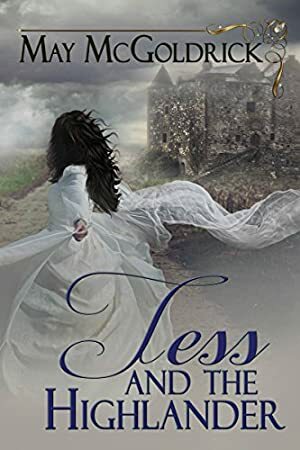 From her scant clues, though, Colin comes to one conclusion: he must return Tess to the mainland to reclaim her birthright, even if it means losing her to a destiny that does not include him. Log In to track Jan Coffey on eReaderIQ. to be notified each time the price drops on any book by Jan Coffey. to stop tracking Jan Coffey. Log In to track May McGoldrick on eReaderIQ. to be notified each time the price drops on any book by May McGoldrick. to stop tracking May McGoldrick. We started tracking this book on April 15, 2013. This book was $5.00 when we started tracking it. The price of this book has changed 27 times in the past 2,198 days. The current price of this book is $4.88 last checked 3 months ago. This lowest price this book has been offered at in the past six months is $4.40. The lowest price to date was FREE last reached on April 22, 2016. The highest price to date was $5.00 last reached on October 18, 2015. This book has been $5.00 6 times since we started tracking it. We last verified the price of this book about 3 months ago. At that time, the price was $4.88. This price is subject to change. The price displayed on the Amazon.ca website at the time of purchase is the price you will pay for this book. Please confirm the price before making any purchases.